I love any outfit that incorporates layers. I snagged this peplum top on the sale rack at Anthropologie. It was only $20! I never disregard a sale rack!! This top will look great in the summer with a pair of white jeans, but for the time being, it looks great with another top layered underneath. I love the mix of stripes with the geometric texture of the peplum top. I'm also a cashmere lover. This green cashmere cardigan is the perfect piece to wear over the look. When adding layers to a look, think about the colors that compliment each other. Green and blue is a classic color combination but still looks different and new. I also love a great statement piece. 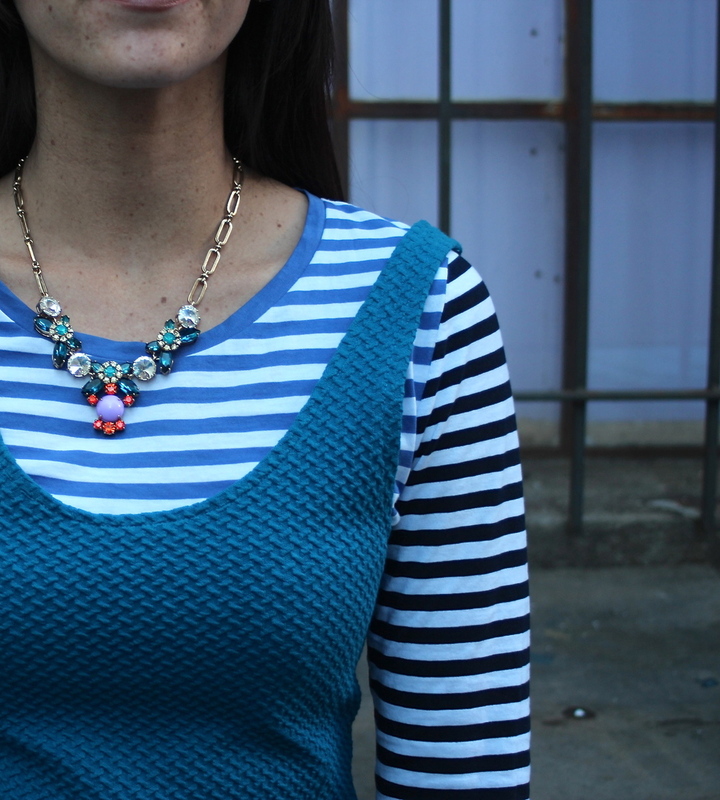 Recently, this jewel toned necklace from J.Crew has been my favorite. Jewel tones look great with all kinds of colors because they are so complimentary and easy to work with. In this particular look, the blue jewels really shine through. Everyone should have a great interchangeable statement piece. Shine bright like a diamond, baby!